Westerville North pitcher Mason Lowder keeps an eye on Olentangy’s Ben Brewster as he gets his lead at first during Friday’s OCC showdown in Lewis Center. LEWIS CENTER – Olentangy baseball coach Ryan Lucas had a thesis statement to his dissertation after his team’s 8-6 loss to Westerville North at home. “I gotta do a better job of coaching our guys,” he said. Olentangy overcame an early 2-0 deficit with an RBI double by Sutton Bucci followed by a run-scoring single by Max Caron in the second inning, then took the lead when Connor McCulty scored on a wild pitch after he doubled with one out in the third. 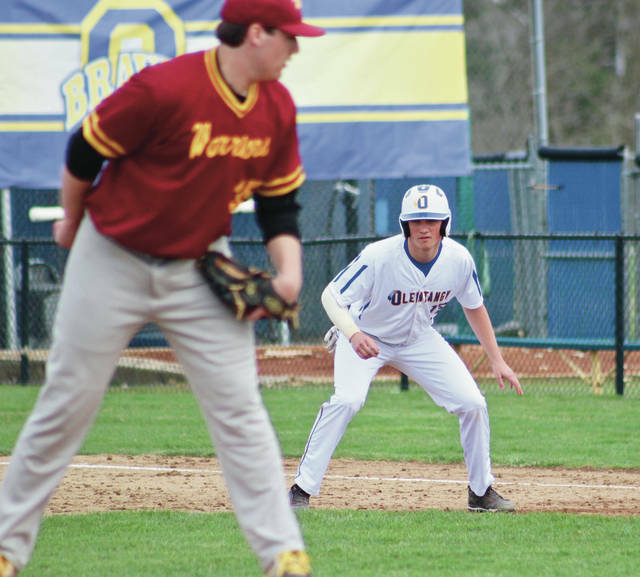 Olentangy had a chance to add to its lead when Ben Brewster reached on a dropped third strike throwing error to load the bases with one out. But, North pitcher Mason Lowder coaxed a popout and a groundout to end the threat. “It’s kind of been the achilles heel for our team – we’re getting guys on base, in scoring position, bases loaded – and we just can’t drive them in,” Lucas said. Then, Lucas went back to his thesis statement. It came back to haunt when North scored four runs in the fifth to take the lead for good. Adam Stefanelli, Brandon Bond and Auri Dover all had singles to load the bases at the start of the inning. Lowder followed with a liner to right to drive in two runs and chase Olentangy starter Danny Del Gratta. North added another right before reliever Josh Anderson threw his first pitch when Lowder took off for second to grab the attention of the lefty. Dover came home on the throw to second to complete the double-steal and push the Warrior lead to 5-3. Ty O’Hearn added an RBI single and Lowder added an RBI single in the sixth to push the lead to 7-3. JJ Dixon opened the seventh inning with a long fly ball to the gap in right-center. The ball appeared to have wedged under the fence, forcing centerfielder Jace Middleton to throw up his arms. Dixon stopped at second anticipating the ground-rule call, but it never came. So, he took off and made it home for an inside-the-park home run to push the Warriors’ lead to 8-3. Olentangy made it interesting in the bottom half when Brewster hit a three-run homer to center. Middleton reached on an error, Bucci was hit by a pitch on a three-ball count and pinch-hitter Cole Couchman fouled off three two-strike pitches before lining a single to right to load the bases with two outs. Reliever Brennen Albertini got a strikeout to end the game and preserve the win for the Warriors (5-5, 1-3). It was a different side of the coin for North, which had lost all three of its league games by a combined four runs. “It was nice to be the higher number on the scoreboard after the game was over,” Ring said. Lowder, Stefanelli and O’Hearn had three hits apiece to lead North at the plate and Lowder got the win on the mound with 6.2 innings of work. He allowed six runs, five earned, on nine hits, a walk and a hit-batter and struck out six. Del Gratta took the loss for Olentangy (6-5, 2-2). He allowed six runs, five earned, on eight hits and two walks and struck out six over four-plus innings of work. Brewster finished with two hits, including the homer, to lead Olentangy on offense. Next up, Olentangy hosts Hilliard Davidson in non-league play today at 11 a.m.